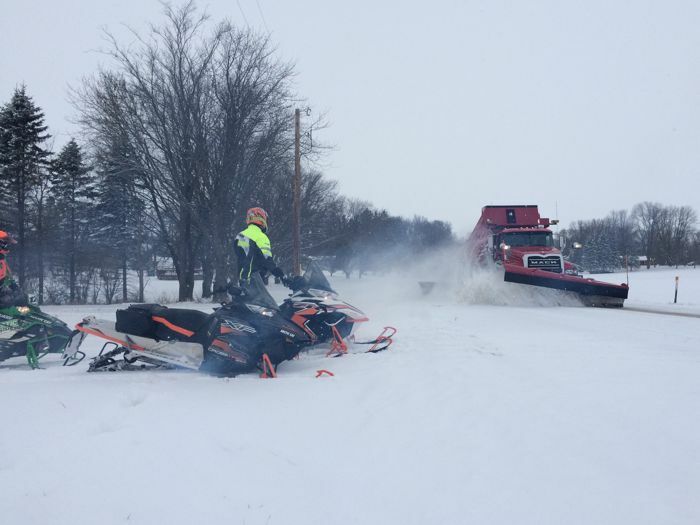 A good ol' snow storm dumped 9 inches of snow on southern Minnesota this last week of 2015. It was one of those occasions when the weather forecasters' dire warnings about big snow were accurate, with 6-9 inches blanketing the southern third of the state. 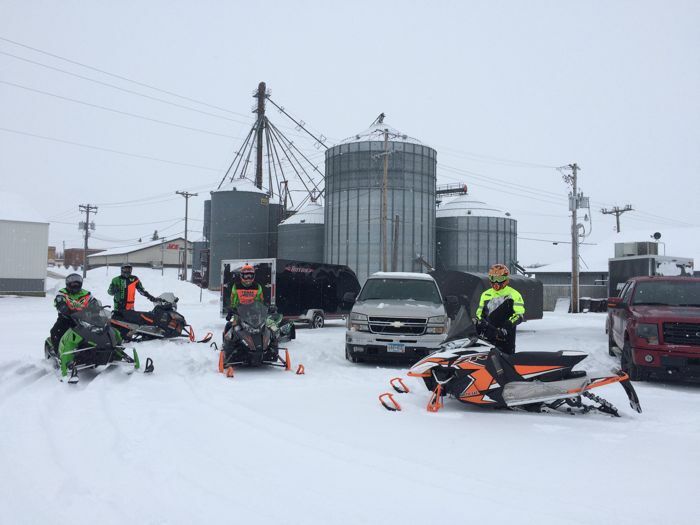 A group of us had previously made plans to ride Minnesota's North Shore on this day, but the allure of fresh snow in the beautiful Bluff Country area of Southeast Minnesota caused a shift in plans. 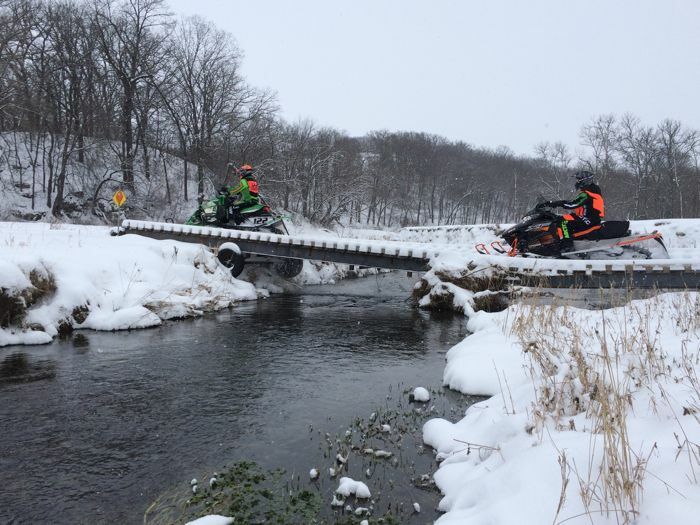 While the last whisps of snow fell early Tuesday morning, my cohorts Pat Bourgeois (OSM Magazine), Kale Wainer (Arctic Cat), Dean Kasparek (bro-in-law) and Calvin (son) descended on the town of Zumbrota (above), unloaded our sleds and took off with one simple plan: experience the cool bluffs, rivers and towns that define the region. 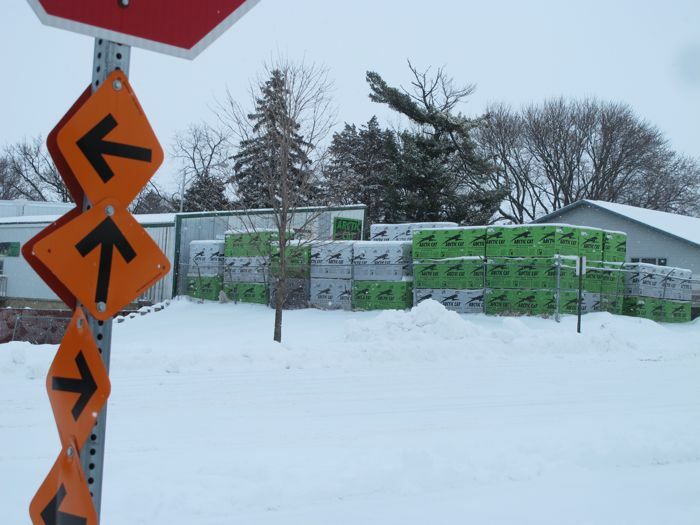 With snow on the ground, snow falling from the sky and snow being plowed off the roads, it was as if we were pretty suddenly thrust into REAL winter. It's pretty great when that happens. While everyone was antsy to ride, I thought it would be best to read through the latest issue of OSM Magazine before we went too far. I learned what's hot and what's new in the sno-mo-world. Fair warning: Because of the clouds and falling snow, I do not have that perfect photo to illustrate the steep and beautiful bluffs of this region. There are wonderful trails throughout SE Minnesota. They offer a variety of terrain, from the rolling farmland that's on top of the bluffs to the steep, forested traverses that extend down to the many creeks and rivers that cut meandering paths throughout the area. Lots of trails run parallel to the rivers. ... and this one somewhere between Hammond and Millville. Add to the mix a variety of pine groves plus long and twisty buffer strips in the hilly farmland, and you have a recipe for scenic, fun riding that is worth experiencing. 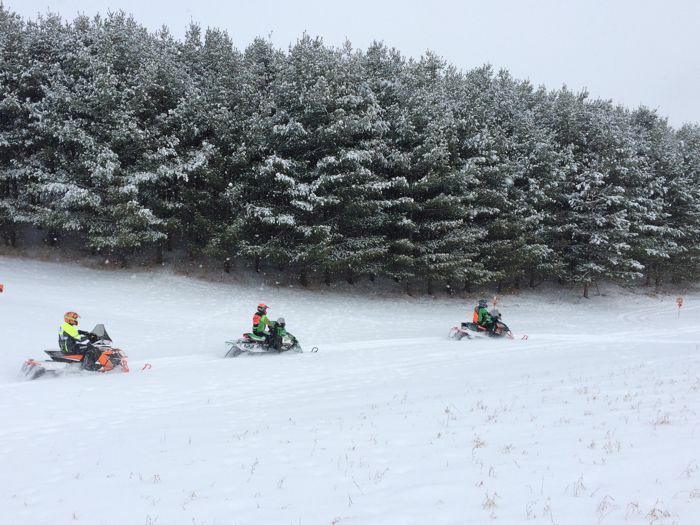 This part of the state doesn't always have the best snow, so it's worth hitting when the conditions are favorable. 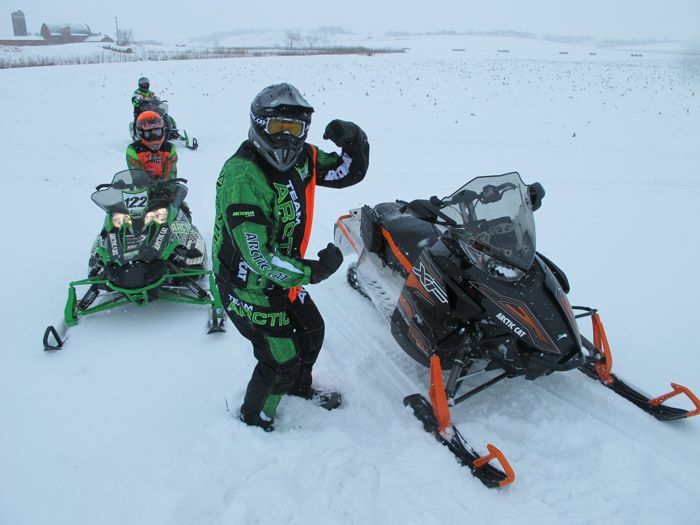 After putting some miles on his new Arctic Cat Crosstrek 6000, Kale busted out a backwards "Safety Dance" number from the one-hit wonder band, Men Without Hats. I threw down some truly spectacular skillz, carving the powder like the true honch that I pretend to be. 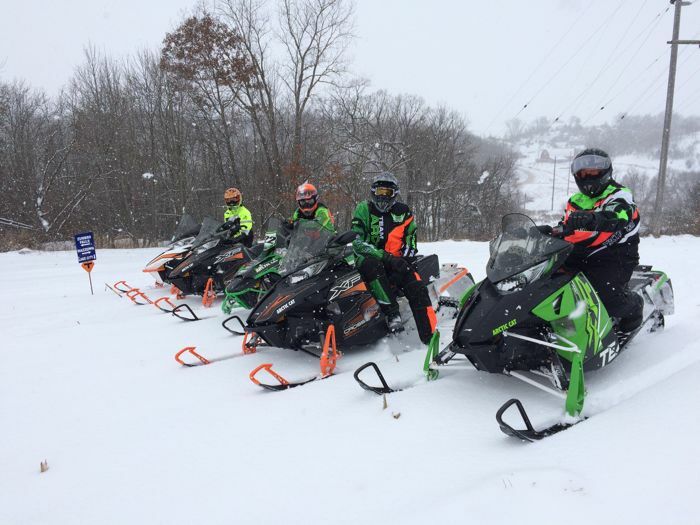 We rode the trail into Mazeppa, home of the MotoProz Arctic Cat dealer. 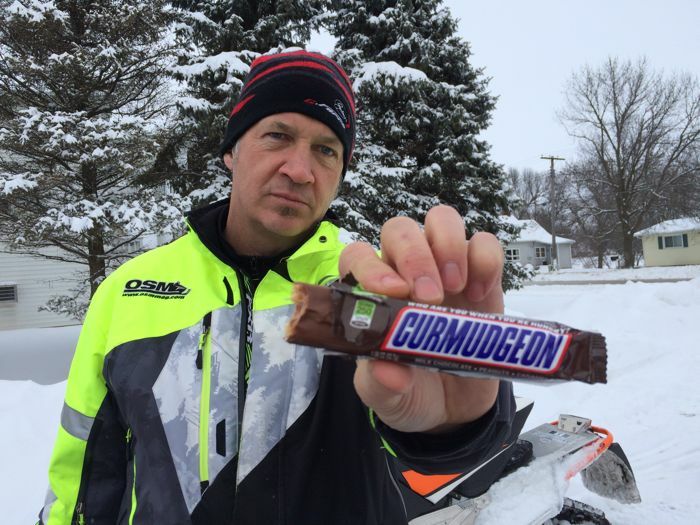 On most rides like this we would typically find ourselves stopped at a great dealer like this, because Pat mercilessly abuses and breaks his snowmobiles (or he forgets his helmet and has to buy one) and needs help fixing his stuff. But this was a rare occasion when everything worked smoothly. Crossing another creek, somewhere between Mazeppa and Oronoco. 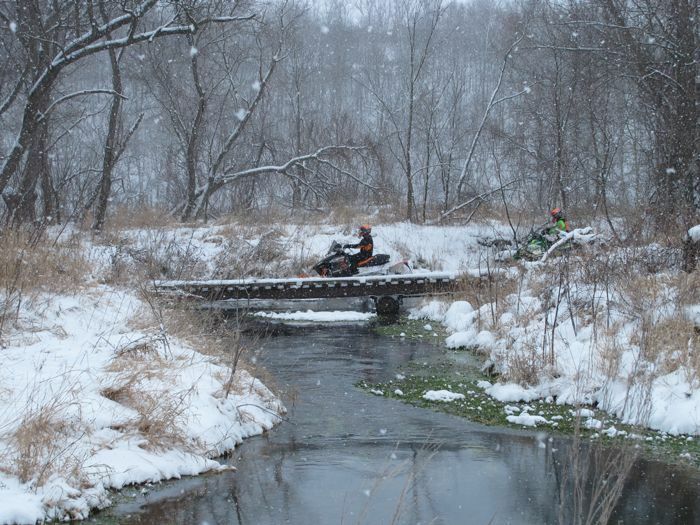 All totaled we logged 110 miles; enjoyed a gas station lunch of beef jerky and Corn Nuts; rode ourselves dizzy throughout the bluffs and river trails; banged a few ditches; put one sled on its side; and read a truly great snowmobile magazine while parked along the trail. 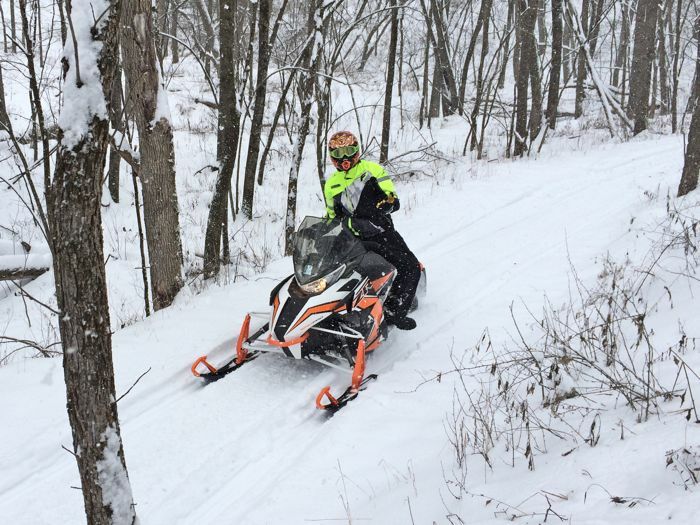 This was my last ride of 2015. If it's a precursor to what's ahead for 2016, I can hardly wait. Was up in Ely earlier this week and they have not done a very good job with trail maintenance as there was nothing but brush coming down from both sides of the taconite trail. Scratched the hell out of my new 15 ZR 6000. Snow was fair to good so not sure what is going on up there. Another great story John! 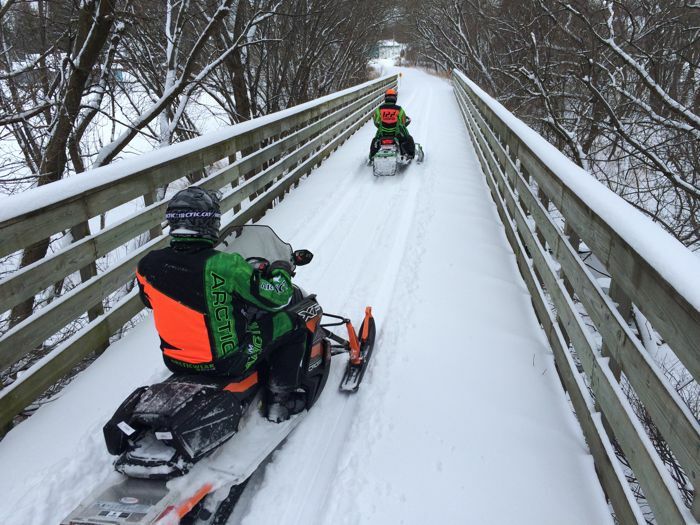 The riding in that area and across the river in Wisconsin is some of most scenic around. 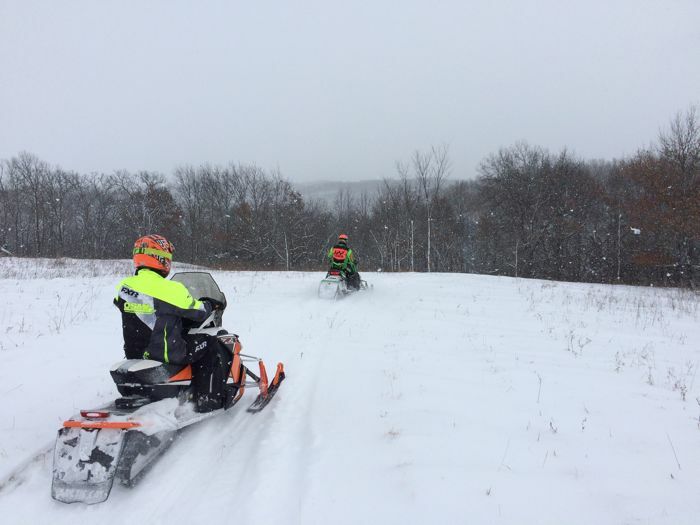 The clubs in the area do a great job of trail prep and grooming, any one who goes there to ride would not be disappointed. Trails are not open here. (east central Wisconsin) Too much standing water with no frost in the ground. S#1T. Another nice report John! I'm interested in the crosstrek. Which motor would you consider to be the best all around package? I ride upstate NY and Quebec. Any suggestions are greatly appreciated. Happy new year! 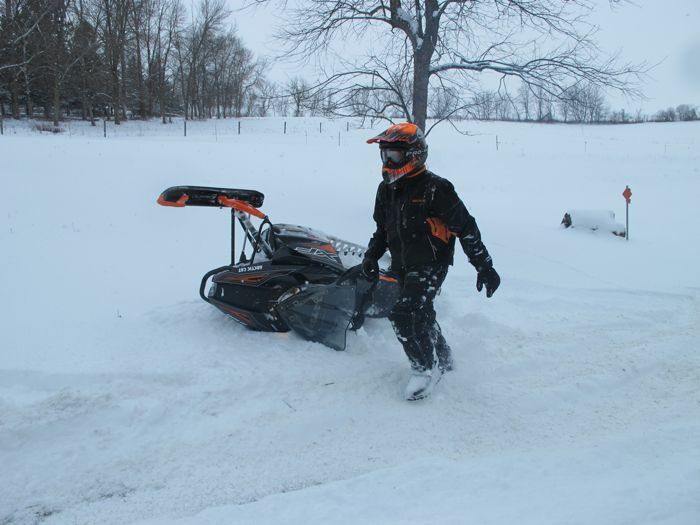 Justin: I'm on a 8000 Crosstrek this year, because I rode 6000 sleds the past two years and I wanted to compare what I thought of the two engines. In general, I like the lighter weight, lower oil consumption and higher MPG of the 6000. And for 95% of my riding, it's all the motor I'll ever need/want. 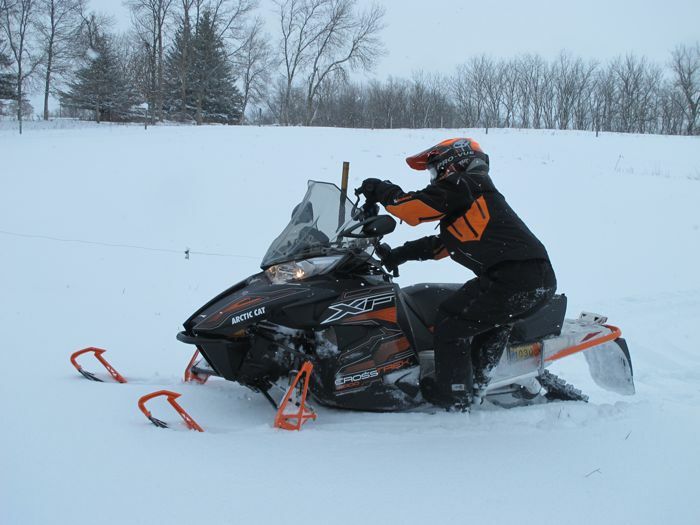 However, I chose this sled for its truly all-around capabilities, including off-trail features. 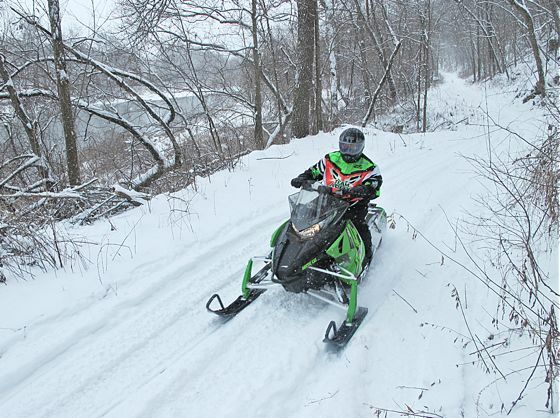 In big-snow conditions when barreling through swamps or really deep snow, there could be a few times when the 8000 is better. I'll have a more informed answer for you at the end of the season. Engine discussion aside, I love this sled. I've already used the saddlebags; it comes with the size windshield that I prefer; I like the track a lot; and the 137 track/suspension is pretty great. I even like the mirrors. I'm really happy to see you guys came to explore "bluff country"! This is where I'm from and read OSM and ArcticInsider frequently. However, you only experienced the "tip of the iceburg" so to speak! Next time you will have to venture further SE and get into the really hilly country. Making loops or straight line rides along the Mississippi River is absolutely fantastic and provides amazing scenery and also some good burger joints along the way. Anyway, thanks again for coming south to ride and give recognition to this beautiful area many of us call home and "God's Country". Looks like great part of our state to ride! I'll look forward to exploring those parts someday, soon I hope. Now that the snowmobile has been invented, I can probably go with Paul Hein. 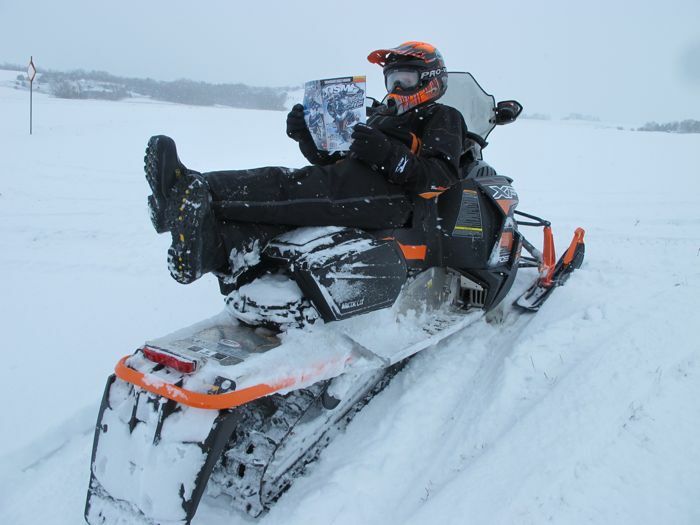 Moto Proz use to be called Kelly's Sales and Service it is the 2nd oldest Arctic Cat Dealership. As always a great write up, Right in my own backyard, I didn't even know. Looks like a road trip is in order to check this area out!